SALT represents the student community for the Early Years and Elementary School students. 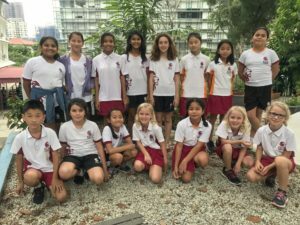 Their role is to help plan school activities under the guidance of our teachers, which will allow and encourage all students in school to participate and play their part. They are proud to have been able to contribute towards the organisation of the successful ‘Sports Day’, Pyjama Day at school, participate and organise the weekly school assemblies and various other house activities, and lead in the on-going Food Bank Drive which encourages their fellow students to help the local charities with food donations to those less fortunate in the community. SALT members are also involved with the leadership of various class projects. As student leaders, they ensure that they are there to help their fellow students resolve issues as and when these arise. Being a part of SALT, being able to organise events for the benefit of everyone and being there to help their fellow students is very satisfying. By contributing to the success of ISS International School and helping others, they also build their leadership skills.